Alliance Resources has - as my posts have shown - pretty ordinary operating metrics but exceptional financial metrics. Labor productivity is low and falling - profit is high and rising. On an operating level this looks very like the (bankrupt) Patriot Coal. On a financial level it is world-beating. So far though I have shown only one explanation - and it only explains about 140 million pre-tax in cumulative profits. Alliance Resources seems to systematically under-reserve for (self-funded) workers compensation. That is important - it invites a class action for instance - but the amounts of money are nowhere near sufficient to account for the differences in performance. There has got to be more to it. One of the main differences between Alliance and its competitors is the price it receives for its coal. Alliance sells almost entirely high sulfur Illinois Basin coal. There is no price series for Illinois Basin coal in Bloomberg any more. When the series ended in 2007 high sulfur coal traded at a $5 per ton discount to mid-sulfur coal. If you look at Arch Coal's numbers their high sulfur coal trades at a $3.50 discount. The closing discount makes sense because more of the power stations have scrubbers. 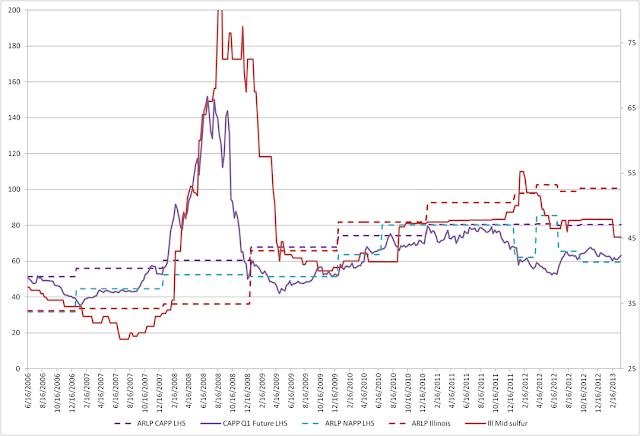 Anyway here is the price series for Alliance Coal (by source) versus the mid-sulfur index. What you see is remarkable. 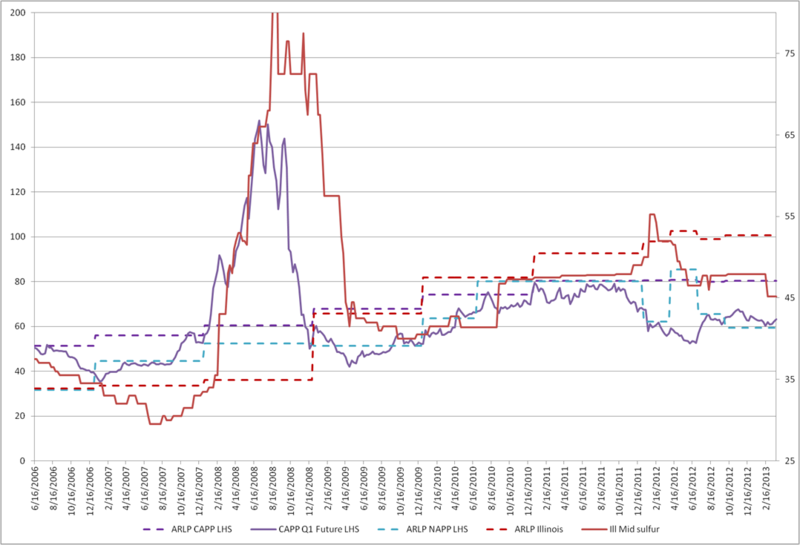 There was a period where ARLP sold coal under contract at prices quite a bit lower than spot. However the price they receive is now rising and well above spot. In particular ARLP is now obtaining about $8 of premium per ton for their coal over Illinois Mid Sulfur coal. Whilst Bloomberg no longer have a price series for Illinois Basin high sulfur coal my contacts (and comparison with Arch Coal) say that ARLP coal instead of trading at an $8 premium it should trade at a $3.50 discount. That $11.50 makes a huge difference. Alliance produces about 30 million tons of high sulfur coal - so the difference equates to $345 million in pre-tax earnings or EBITDA. Income from operations in 2012 were $334 million - so the higher prices accounts for all of it. Arch sells Illinois Basin coal at $42.50 under contract. That is almost $14 below ARLPs latest blended received prices - however I think on a like-for-like basis [stripping out a some Appalachian coal] the difference is closer $11. If prices were reset to market (that is $10-11.50 lower) then the ability of this MLP to make distributions goes away. Indeed it is hard to see how they pay their debts. Bankruptcy is the likely outcome. If the prices go towards the $42.33 that Arch Coal is contracted to (in 2014) for Illinois Basin coal then Alliance debt holders will wind up extremely short. This is by far the main explanation I have found for the superlative financial performance of Alliance Resources. Alliance has just contracted at far higher coal prices than the opposition. Without these high prices Alliance would look like another very stretched coal mine with mediocre operating performance - but with a lot of debt - and it will probably go bankrupt. The stunning performance of Alliance is a little from under-reserving workers compensation but mainly because the management team have extracted contract prices massively better than the competition... this is a company where the successes have been by senior management and white collar employees (those who sell the coal) rather than the workers who mine it. The chart itself suggests the explanation: the prices in the contract look like they are regularly escalating. They were way below market for a while and are now a fair bit above market. It looks like the company entered some escalating price contract when its bargaining power was very strong. Virtually all of our long-term contracts are subject to price adjustment provisions, which permit an increase or decrease periodically in the contract price to reflect changes in specified price indices or items such as taxes, royalties or actual production costs. These provisions, however, may not assure that the contract price will reflect every change in production or other costs. Failure of the parties to agree on a price pursuant to an adjustment or a reopener provision can, in some instances, lead to early termination of a contract. Some of the long-term contracts also permit the contract to be reopened for renegotiation of terms and conditions other than pricing terms, and where a mutually acceptable agreement on terms and conditions cannot be concluded, either party may have the option to terminate the contract. These are not reset to spot prices. These are reset in prices due to changes in operating costs and the like. Still resetting of the prices for this company to anything akin to market means likely bankruptcy - so the contract resetting terms are critical. I figured that I have to look at more detail at the contract terms, price and volumes. And what I found made left me with a few options - all ugly. Unfortunately, you are going to have to bear with me through a little bit of arithmetic. ...[W]e have entered into long-term coal supply agreements with many of our customers. These arrangements are mutually beneficial to us and our customers in that they provide greater predictability of sales volumes and sales prices. In 2009, approximately 92.6% and 91.1% of our sales tonnage and total coal sales, respectively, were sold under long-term contracts (contracts having a term of one year or greater) with committed term expirations ranging from 2010 to 2016. Our total nominal commitment under significant long-term contracts for existing operations was approximately 138.7 million tons at December 31, 2009, and is expected to be delivered as follows: 29.2 million tons in 2010, 26.9 million tons in 2011, 20.4 million tons in 2012, and 62.2 million tons thereafter during the remaining terms of the relevant coal supply agreements. The total commitment of coal under contract is an approximate number because, in some instances, our contracts contain provisions that could cause the nominal total commitment to increase or decrease by as much as 20%. The contractual time commitments for customers to nominate future purchase volumes under these contracts are typically sufficient to allow us to balance our sales commitments with prospective production capacity. In addition, the nominal total commitment can otherwise change because of reopener provisions contained in certain of these long-term contracts. The way to think about this: 25.0 million tons were sold in 2009 – 92.6 percent under long term contracts. That is 23.15 million tons were sold under contracts. The next years – as stated – are 29.2 million, 26.3 million and 20.4 million. After that we do not really know (we only know the totals) so I have assume 20 million tons per year – but marked this in the following table in yellow [to indicated that it is a guess]. In 2010, approximately 92.4% and 89.0% of our sales tonnage and total coal sales, respectively, were sold under long-term contracts (contracts having a term of one year or greater) with committed term expirations ranging from 2011 to 2016. As of January 28, 2011, our nominal commitment under long-term contracts was approximately 31.1 million tons in 2011, 27.3 million tons in 2012, 24.1 million tons in 2013 and 19.0 million tons in 2014. Tons sold in 2010 were 30.3 million. In 2011, approximately 92.2% and 90.5% of our sales tonnage and total coal sales, respectively, were sold under long-term contracts (contracts having a term of one year or greater) with committed term expirations ranging from 2012 to 2016. As of January 28, 2012, our nominal commitment under long-term contracts was approximately 33.8 million tons in 2012, 33.5 million tons in 2013, 27.2 million tons in 2014 and 19.8 million tons in 2015. Tons sold in 2011 were 31.9 million. In 2012, approximately 94.2% and 94.3% of our sales tonnage and total coal sales, respectively, were sold under long-term contracts (contracts having a term of one year or greater) with committed term expirations ranging from 2013 to 2020. As of January 28, 2013, our nominal commitment under long-term contracts was approximately 38.5 million tons in 2013, 30.7 million tons in 2014, 23.4 million tons in 2015 and 18.7 million tons in 2016. Tons sold in 2012 were 35.2 million. Just can also work out the size of the incremental contracts sold in each year. This is in the following table. The table has one startling implication: the company has never quite delivered the contractual amounts under contract. For example in 2009 they had contracted for 29.2 million tons to be delivered in 2010 under contract and they only delivered 28.0 million tons under contract. Incremental contracted volumes are negative in every year - though contracted volumes are positive in the out-years. We also have the price received for each year. This is disclosed in the relevant 10-Ks. We reported Net Income of ARLP of $192.2 million, an increase of 43.2% in 2009 compared to Net Income of ARLP of $134.2 million in 2008. The increase of $58.0 million was principally due to improved contract pricing resulting in an average coal sales price of $46.60 per ton sold, compared to $40.23 per ton sold in 2008, partially offset by lower sales volumes and higher operating expense per ton sold in 2009. We reported record Net Income of ARLP of $321.0 million in 2010 compared to $192.2 million in 2009. This increase of $128.8 million was principally due to increased tons sold and improved contract pricing resulting in an average coal sales price of $51.21 per ton sold, as compared to $46.60 per ton sold in 2009. We reported record Net Income of ARLP of $389.4 million in 2011 compared to $321.0 million in 2010. This increase of $68.4 million was principally due to increased tons sold and improved contract pricing resulting in an average coal sales price of $55.95 per ton sold, as compared to $51.21 per ton sold in 2010. A higher average coal sales price in 2012, which increased to $56.28 per ton sold as compared to $55.95 per ton sold in 2011, resulted from improved contract pricing for Illinois Basin coal sales offset partially by lower coal volumes sold by our Mettiki mine into the metallurgical export markets. Prices per year were thus $46.60, $51.21, $55.95 and $56.28. These higher prices were achieved in an era of falling prices and when older and presumably higher priced contracts were not entirely delivered. The bull case for ARLP (and for many other MLPs) is that the revenue is ensured by longer-term contracts. But these longer term contracts appear to be priced further and further out of the money - and incremental prices achieved appear to be way-out-of-the money. At this point I expected to be reverting to my (late) high school linear algebra but it does not work [this can only be solved if the prices per incremental ton contracted are implausibly high]. The company did not even deliver its contract and yet realized price per ton kept rising despite spot prices falling. (c). The accounting disclosures are simply fiction. I have been around US capital markets long enough to know that you can never quite dismiss the third explanation (that the accounting disclosures are just fiction). But that is still a big step. Explanation (a) large escalation clauses - is consistent with the price chart above. Alliance sold at prices well below market in 2008 and sells well above market now. However (a) has a very big problem. This is that none of the 10-Ks tell us about a coal price escalation clause. And the management team are promotional and would normally tell us. Explanation (b) thus looks more plausible... The prices received are an artifact of cancelling old contracts set at higher prices. That would also explain why the company has failed to deliver its contracted tonnage in every year studied. In that case the new tons must be at much lower prices. We get some guidance in this matter from the accounts of the two largest customers - the Tennessee Valley Authority and LG&E (the large German owned utility). Both these companies suggest that they have derivative liabilities on coal contracts - that is they are contracted to buy coal at above market prices. However in both cases the derivative liabilities are falling fast (consistent with explanation b above). At September 2012 The Tennessee Valley Authority had 46 million tons contracted and they were $267 million underwater on those tons. In other words their coal was $5.80 per ton overpriced. By December they had 48 million tons contracted but were only $224 million underwater - or $4.67 a ton underwater. At this rate by early 2014 The TVA will have rid itself of all out-of-the-money contracts. They may be doing it this fast by paying their way out. Whatever happens Alliance Resources (whose biggest customer is The TVA) will be receiving closer to market prices. If (a) is true then the contracts will wind up being reset. There is a huge contract that was there in 2009 (and still accounts for the bulk of contracted value). That contract does roll over fairly sharply now. When it rolls off prices will be much lower. If (b) is true then the profitability of this company is going to crash because the forward contract prices are massively lower than realized historic prices. This decline will happen fairly fast in this case. Under both scenarios (a) and (b) it is difficult to see how this partnership services its large debt. Any price close to what Arch Capital receives for its coal will result in fairly rapid bankruptcy. Debt-holders beware! The third possibility (c) is probably the best one for shareholders. The third possibility is that this is a massive fraud. In that case it can keep going as long as the management keep lying. In the fraud possibility the stock might take a while to crash (as lies can be very long-lasting) - especially if they can - Ponzi like - continue to raise capital. They will keep paying dividends as long as lenders in particular are dopey enough to continue to lend to them. This is one of those rare cases where I am a short seller and I am hoping the company is not a massive fraud. If its not a massive fraud I am going to get paid fairly quickly. If it is a massive fraud I might be waiting some time. As a short seller I hope it is not a fraud - then I get a quick fairly guaranteed collapse. Is Alliance Resources under-accruing workers compensation obligations? My last post on Alliance Resources explored the differences between Alliance Resources (the best performing coal operation in North America) with Patriot Coal (famously and massively bankrupt). Patriot produced only slightly less coal per worker (a key measure of cost-competitiveness) and it was higher quality coal. They were about the same size - but alas - Patriot was bankrupt and so difficult to run they were closing mines in bankruptcy. The differences lay in the balance sheet where Patriot had large post retirement benefit obligations and Alliance does not - and Patriot had large workers compensation obligations and Alliance does not. The first one I understood. Patriot was heavily unionized. Alliance was not. However the second one I did not understand. These were multi-mine operations in similar jurisdictions with similar numbers of employees. They both self-insure workers compensation. Unless one operation is massively safer than the other they should have similar workers compensation obligations. Patriot Coal had $8.889 million in payments and an estimated total obligation of $185.6 million. The estimate of total obligation is 20.9 times current payments. Payments were $10.48 million - a little higher than Patriot. However reserves were only 77.0 million. The estimate of total obligations is only 7.35 times. Alliance Resources is - relatively to Patriot - extremely under-reserved for workers compensation. If we were to reserve Alliance Resources on the same basis as Patriot we would have to add $141 million to reserves. This difference has accumulated over time. If Alliance had used Patriots conservative reserving pre-tax earnings (and hence EBITDA) would be cumulatively $141 million lower than were actually recorded. This is clearly part of the reason why Alliance appears so profitable relative to the competition. More importantly because Alliance is an MLP which distributes roughly its EBITDA, if a more conservative reserving had been used Alliance's distributions would cumulatively been about $140 million lower. I wonder how the workers expecting to be paid compensation feel about having the money backing their compensation distributed to MLP unit holders? In my crystal ball I see a class action. Your liability as a limited partner may not be limited, and our unitholders may have to repay distributions or make additional contributions to us under certain circumstances. As a limited partner in a partnership organized under Delaware law, you could be held liable for our obligations to the same extent as a general partner if you participate in the "control" of our business. Our general partners generally have unlimited liability for the obligations of the partnership, except for those contractual obligations of the partnership that are expressly made without recourse to our general partners. Additionally, the limitations on the liability of holders of limited partner interests for the obligations of a limited partnership have not been clearly established in many jurisdictions. Under certain circumstances, our unitholders may have to repay amounts wrongfully distributed to them. Under Delaware law, we may not make a distribution to our unitholders if the distribution would cause our liabilities to exceed the fair value of our assets. Delaware law provides that for a period of three years from the date of the impermissible distribution, partners who received the distribution and who knew at the time of the distribution that it violated Delaware law will be liable to the partnership for the distribution amount. Liabilities to partners on account of their partnership interest and liabilities that are non-recourse to the partnership are not counted for purposes of determining whether a distribution is permitted. Alliance Resources (a minor obsession of mine) is financially the best performed coal company in America. The stock is near all time records - and distributions are large and unimpaired. Patriot Coal is in a spectacular bankruptcy. I thought it reasonable to compare the best of the best with the worst of the worst - just to see how different they really were - perhaps so I could pin down what made Alliance Resources special. Here the companies are compared by tons, employees and tons per employee. Alliance is better - it is smoother for instance - which means less hiring and firing. And it does not have the crash in productivity at the end - but that crash happened after the bankruptcy. But it is not massively different. It probably makes sense to use the balance sheet data from 2011 (before multiple restatements) rather than 2012 to examine Patriot because that was before the bankruptcy mucked everything up. In those days Patriot was still humming along (admittedly in some distress). Patriot produced far better coal. Some of their coal was metallurgical - and most was lower sulfur. This coal should get a massive premium price - so that is one in favor of Patriot. Patriot had in 2011 way less debt than Alliance has now. This is kind of amazing - you can go spectacularly bankrupt with an operation this size and this level of productivity. The main difference is in the size of other balance sheet liabilities. Patriot had $238 million in workers compensation obligations (2011) versus Alliance having only $68 million (2012). Even more pronounced is the post-retirement obligations where Patriot had $1387 million (2011) versus Alliance at a mere $31 million. Alliance might say that this was the benefit of a non-unionized workforce but if that is the case then union concessions would be enough to revive Patriot (and that does not look likely). There is quite a deal that is strange and unusual about this story. The Wall Street Journal is again suggesting that Verizon may buy Verizon Wireless from Vodafone. As noted in the previous post this is insane. It incurs a completely unnecessary twenty billion dollar tax bill. The only deal that makes sense is for Verizon to buy Vodafone in its entirety. If Vodafone will not sell there is a solution for Verizon: go hostile. As detailed in the previous post Vodafone has been had a decade of modest successes and abject failures made good by a single amazing success. The amazing success is that they owned 45 percent of Verizon Wireless - the best performed US Wireless company. I noted that Vodafone's great success is the only substantial asset that they do not manage. Several UK fund managers (reasonably) pointed out that this was not entirely fair. The history is instructive. During the tech-bubble Vodafone got properly carried away. Not only did they pay up for spectrum (which may not have been a choice given WorldCom competing at auctions) but they paid top-dollar for several assets entirely by choice. The biggest mistake was that they purchased Mannesmann at the height of the bubble for $170 billion USD. This deal is second only to AOL-Time Warner as the most stupid large deal of the tech-bubble era. Over the next couple of years the delusional bubble-era management were replaced by bland mediocrities who did not do very much wrong at the cost of not doing very much right. Vodafone had completely "rogered" its balance sheet during the bubble and as a result did not participate in the cheap spectrum auctions around the world that happened during the 2002-2007 period. Getting carried away in a bubble has permanent effects (just ask Citigroup or BofA if you need more recent examples). My UK fund-manager contacts thought that I was being harsh on Vodafone criticizing current management for their complete lack of spark. They thought the current management were chosen to be boring and fulfilled that task admirably. By contrast, the Baby Bells did not participate much in the madness of the tech bubble - leaving that to the CLECs (anyone remember McLeod) and Worldcom and Enron Broadband, Global Crossing and the like. The Baby Bells were boring. As befits the end of a bubble - the meek were left standing and inherited much of the USA. The Baby Bells consolidated to form Verizon and AT&T and have solid balance sheets, good businesses and the absence of insane competition. Their cycle was the opposite of Vodafone. They were boring when Vodafone was exciting and they are now strong when Vodafone is weak. In any deal Verizon deals from that strength - strength created more than a decade ago. Sir Brian Pitman once told me that the only real bids are hostile bids. He had a sort of logic: in a negotiated bid it is highly unlikely the acquirer is getting an outright bargain. Negotiated bids happen with a willing seller. Hostile bids however change the world. The stock market is full of incorrectly valued securities. It is fairly common for stocks to lose 70 percent of their value or triple. As a corollary the stock market is full of securities trading at a third of fair value and three times fair value. Hostile bids are typically done without due diligence - and the range of outcomes is large. In a hostile bid you might pick up an asset for a third of fair value or three times fair value. These extreme outcomes don't happen so much in negotiated bids. The result: hostile bids change the world. Extreme variation makes hostile bids either extremely good or extremely bad. Hostile bids can be extremely good or extremely bad because you can't do due diligence. However in this case if Verizon were to bid for Vodafone Verizon would know what they are getting. The WSJ story linked above suggests that the Verizon Wireless stake is worth between $106 and $137 billion. I have a slightly higher number. The total market cap of Vodafone is $137 billion. Vodafone is trading below what I think the stake in Verizon Wireless is worth. Verizon can bid fair value for what the Wireless stake is worth and get the rest for free - and it is obviously worth more than nothing. Even the Australian asset has some value! And Verizon obviously do not need to do due diligence on Verizon Wireless. In other words Verizon can have all the pluses and very few of the negatives of a hostile bid. A hostile bid is possible of course because the UK fund managers have little faith in the mediocrities that now run Vodafone. Vodafone is cheap because of management. I know if there is an American bid for this UK champion there would be all sorts of nationalistic squeals in the UK. But the UK fund management community would donkey-like eventually just accept the bid. For Vodafone that is the cost of a decade of failures. And the meek (the Baby Bells) would in fact inherit the earth. The end of Reader: what does it say about Google? Google has not budged. Reader - by far the best RSS feed for people who get their information by reading - is going dark. Nobody I know however has indicated what this says about Google. So I am going to try. (a). Reader is a service that not many people use - except that it seems inordinately popular with a bunch of thought-leaders including many of the most widely read bloggers. It amazes me that Google can't take a service that popular with thought leaders and turn it into a mass-market product. This is a management failure - Google is clearly not immune to them. (b). The mass-market RSS alternative is Twitter. However among the more wordy-and-literate-and-older RSS is still important. My readers are older, better read, and better educated than the average internet user and I have about four times as many RSS followers as I do Twitter followers. Still as a blogger I needed to face the new reality and get a Twitter feed. In abandoning RSS Google is showing the sort of petulance that a mega-company has when it missed a mass-market trend. It seems pretty obvious now that Google is going to want to buy Twitter. (c). Google is in the process of abandoning its mission. Google's stated mission is to organize all the world's information and make it universally accessible and useful. RSS is a way that a small number of us organize our information. Google no longer cares. It seems what they care about is mass-markets - see the Twitter comments above. (d). Twenty percent time is dead at Google. Reader was a great product produced by twenty percent time but it was never shown any love - and no serious attempt has ever been made to monetize it. Even if you manage between 8PM on Saturday and 10AM on Sunday (your twenty percent time) to develop a modestly successful product Larry Page will not care. If you want to be entrepreneurial work elsewhere. (e). Obvious steps to use the RSS feed to extend or expand other Google products have not been made. The idea of shifting your RSS feed into your Google+ account was seemingly not tried. Rather than abandoning Reader Google could have directed all the thought-leader eyeballs to Google+ - and offered more product. I guess Google has also given up trying to make Plus a serious alternative to Facebook. If it is not a mass-market Google is not interested in it. (f). Google's slogan is "Don't be evil". But the only agenda now is to go after mass markets and make lots of money. Larry Page's self-image is benevolent dictator but really this guy is demoniacally going after big prizes. Larry Page is as evil as Larry Page perceives necessary. (g). This obsession is going to lead competitors to openings. Yahoo for instance could immediately get all those thought leaders by offering a clone of Google Reader and offering a seamless transition. Feedly might get there (but Yahoo! will then buy them). Ignoring people around the fringes of your market is dangerous. Bronte owns Google stock and has done so for some time. The new - and evil - Larry Page is going to make lots and lots of money. Short term the stock will probably continue to go up. Long term I am not so sure. Google is annoying its more entrepreneurial staff by killing any pretense of twenty-percent time. Further, Google is leaving openings for competitors. Finally Google has snubbed people around the fringes of their market and deeply pissed off users are clearly negative for Google. Google relies critically on the trust of their users. I - along with many others - feel betrayed. In the last post of my Alliance series I demonstrated on key operating metrics that Alliance Resource Partners was not just a bad coal mining operation - it was a flat-out terrible operation. It had raised its capital intensity 350 percent, substantially reduced the grade of the coal it exported and reduced labor productivity over 20 percent. And it had become more bureaucratic at the same time. Moreover the maintenance capital expenditure per ton produced has risen from 43c to over $8. These seem to be fairly brittle machines - put a ton of coal through the chute and you have induced $8 of repair obligations on the kit. Like wow - imagine all the people running around repairing stuff. This is - to put it mildly - surprising. It is surprising because Alliance Resource Partners is the highest valued coal mining operation in America with the best performing stock. There is at this company a very large disconnect between operational performance and financial performance. To be fair though - rising capital intensity is a problem across the industry (it is just more intense at Alliance). Peabody is the biggest coal mining company - and a good comparable. By 2000 Peabody had 15.4 billion in gross PP&E was 225 million tons. The capital required per ton was now $68.4. The capital intensity had gone up 2.5 times. Clearly this is an industry trend - albeit a worse trend at Alliance than at Peabody. Employee numbers had moved from 7200 to 8200. Tons per employee thus moved from 26,400 to 27,400 - a slight improvement in labor productivity. The same trends are everywhere I look. The industry has substantial increases in capital intensity - but not as intense as Alliance Resources, but marginal improvements in labor productivity. It is on the labor productivity metric that Alliance stands out most intensely. Alliance has declining labor productivity. However just how startling Alliance is is better demonstrated when you look only at the plant and equipment part of property plant and equipment. Peabody is only using roughly $4.5 billion gross in buildings, improvements machinery and equipment. And it produces 225 million tons annually. Alliance it seems uses over $1.6 billion (gross) in mining improvements, processing facilities and building improvements to produce about 35 million tons of coal annually. To put it mildly - Alliance Energy uses a lot of machines both relative to competition and relative to its size and relative to its history. This thing keeps installing machines and its labor productivity keeps falling. Very strange. Doubly strange because the profitability measures at Alliance are so outstanding.